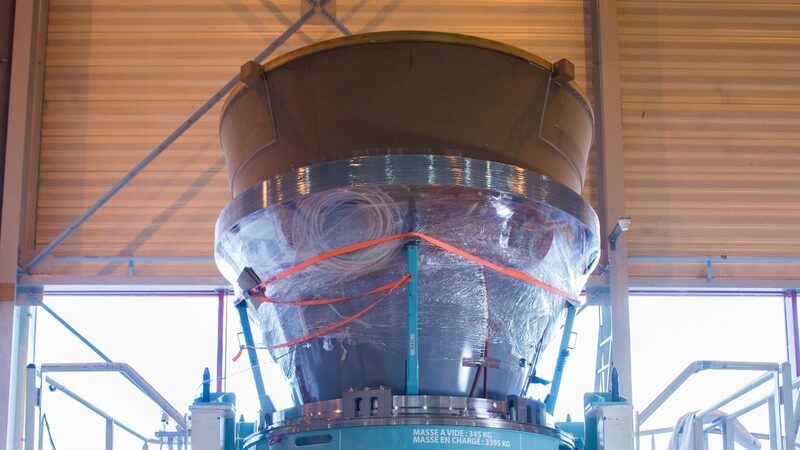 The first nozzle of the P120 solid rocket motor common to the future European launchers has just left for the Guiana Space Centre in Kourou (French Guiana). It will be fitted to the body of the booster intended for the first firing test on the solid rocket booster test stand (BEAP). This nozzle, which makes use of the most advanced solid fuel technologies, was designed by the ArianeGroup teams on the Le Haillan site near Bordeaux. The P120 nozzle is a model of technological success and design to cost. It meets the exacting demands of the Ariane 6 and Vega-C programs. This achievement is the result of the experience acquired by our teams with the Ariane 5 and Vega programs. This new nozzle comprises a number of highly competitive innovations, such as a flexible pivot with composite reinforcements and transfer of elastomers, jet path parts made of a new carbon/carbon material, a composite divergent nozzle with industrial winding and fully automated assembly. The P120 contains 142 metric tons of solid propellant, its lift-off thrust can reach 400 tons and the motor runs for 130 seconds. The nozzle allows very high speed ejection of the very hot gases (3,000°C) generated by the motor, thus creating thrust by transforming the energy of the combustion gases into kinetic energy. It can also pivot, which enables the launcher to be piloted. The technologies and materials used, including thermostructural(1) composites, are able to deal with these extreme conditions throughout the motor’s operating period. The nozzle contributes to meeting the goals of the Ariane 6 and Vega-C programs: optimized costs, shorter cycles owing to a simplified design and the use of innovative technologies and processes. composite materials with excellent mechanical properties at very high temperature. Design authority and industrial lead contractor for the development and operation of the Ariane 6 launcher on behalf of the European Space Agency (ESA), ArianeGroup coordinates an industrial network of more than 600 companies in 13 European countries, including more than 350 Small and Medium Enterprises (SMEs).